Celebrex • School had said it was cheated out of billions of dollars. 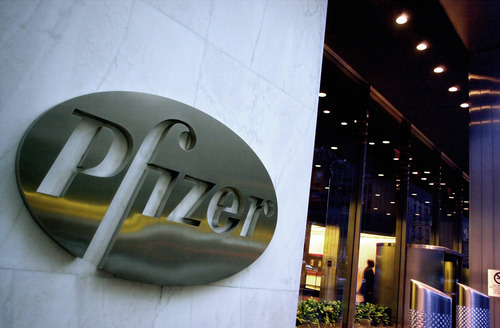 Mark Lennihan | Associated Press file photo Pfizer had claimed that a BYU professor's work did not contribute to the development of Celebrex, which has earned the company perhaps $35 billion in sales, according to court documents. One month from the scheduled beginning of a complex eight-week trial, Brigham Young University and drug giant Pfizer Inc. settled a lawsuit Tuesday for $450 million over whether the Utah school had been cheated out of billions of dollars in royalties for aiding in the development of the wildly successful anti-pain drug Celebrex. Terms of the settlement of the nearly 6-year-long legal dispute were not disclosed in a Pfizer press release but the New York-based company reported separately that it had taken a $450 million charge against its earnings to settle the matter. BYU claimed in the lawsuit filed in October 2006 that professor Daniel Simmons had discovered an enzyme and a gene called Cox 2 that would allow for development of an anti-inflammation drug that did not have the long-term side effects of aspirin. The school entered into a contract with Monsanto for a joint research project to develop a drug with BYU supposed to receive royalties. The Provo school claimed that discovery was a key to development of Celebrex but Monsanto, which eventually became part of Pfizer, arbitrarily canceled the contract, did not place Simmons on patents and misappropriated his work to create the drug. The product was one of the most financially successful of all time, bringing in revenues of perhaps $35 billion, according to court papers. BYU has claimed it was owed at least $9.7 billion in royalties, but Pfizer's exposure at trial was possibly much greater because the jury could have taken the total revenue from Celebrex sales and imposed triple damages. With a trial scheduled to begin May 29, the two parties sat down Friday for settlement talks in Salt Lake City before U.S. District Judge David Sam. Pfizer put out a news release Tuesday morning announcing that the company had "reached an amicable settlement on confidential terms." The company declined further comment. BYU said only, "We are very pleased with how this matter has been resolved. By terms of the settlement, our response this morning can only reiterate what is stated in the released press statement." As part of the settlement, Pfizer said that BYU will establish a Dan Simmons Chair in recognition of Simmons. "We are pleased to resolve this matter and the uncertainty of litigation, and to be in a position to support Dr. Simmons' research efforts at BYU," Pfizer said in its statement. Pfizer had argued in court documents that Simmons' discovery was not a key to development of Celebrex, which was largely the result of the work of its own scientists. Pretrial rulings in March by U.S. District Judge Ted Stewart largely had favored BYU and would have allowed the school's attorneys, led by Leo Beus of Beus Gilbert of Phoenix, to go to the jury with their legal arguments and evidence largely intact. In other pretrial jockeying last week, Pfizer had claimed that BYU had tainted the potential jury pool by way of a news media blitz that included interviews given to local television stations. BYU is owned by The Church of Jesus Christ of Latter-day Saints, and about 60 percent of Utah residents are members. In an emergency motion calling for the trial to be moved, Pfizer said, "Whatever hope there may have been of obtaining jurors who, despite potential ties to important local institutions such as BYU or the LDS Church, could be impartial, BYU has now willfully made that task impossible." BYU's attorneys said the claim was without merit. A BYU spokesperson on Tuesday declined to say what the school's annual budget is or to what use it might make of the settlement monies. According to court papers, BYU also had been pursuing a licensing agreement with Teva Pharmaceuticals, a generic drug maker, to license Simmons' discoveries should BYU have prevailed at trial on patent claims. With the settlement, that apparently is no longer a possibility.